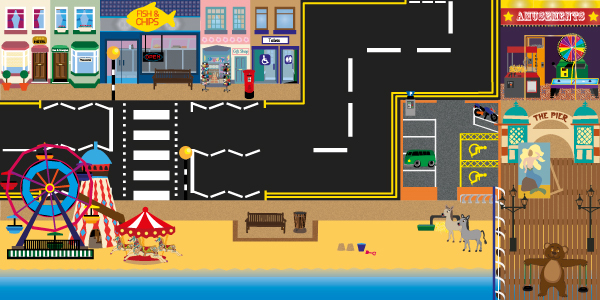 A printable programmable robot mat depicting a seaside town complete with amusement arcades, fish and chips shop, a pier and a Ferris wheel. It is ideal to use in all manner of fun and engaging early years activities at home or in your school or early years setting. It is designed to be printed in several A4 segments and stuck together to form 1 large picture. It would work best if used in conjunction with a transparent plastic grid such as this one available from Amazon. Please note this resource has been designed to help you make the most of your Bee Bot , which is a wonderful resource. It has been designed using original ELHQ artwork and has not been endorsed by the creators of the Bee Bot.